A young refugee from Afghanistan holds his young son and looks at the sea after reaching safely the shores of Lesbos island, having crossed the Aegean sea from Turkey in an inflatable boat full of Afghan refugees. The United Nations refugee agency today proposed far-reaching reforms of Europe’s management of refugees, including the asylum system, recalling that scenes of chaos at borders last year led to a breakdown in the public’s trust in the capacity of governments to manage the refugee challenge and played into the hands of those wishing to turn those fleeing for their lives into scapegoats. 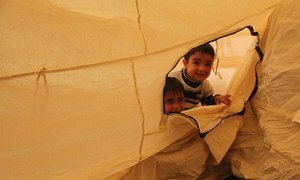 In a paper presented to the European Union (EU), Protecting refugees in Europe and beyond: Can the EU rise to the challenge?, the Office of the UN High Commissioner for Refugees (UNHCR) urged Europe to improve support, preparations, and response aspects of its engagement with the refugees. UNHCR also urged greater investments by European Union (EU) member States to assist refugees with integration, housing, employment and language training. The UN High Commissioner for Refugees, Filippo Grandi stressed in a speech to the European Policy Centre in Brussels that last year Europe failed to implement a collective response to help over a million refugees and migrants. In light of the resultant breakdown in public trust and the fact that the issue was seized upon by those who wanted to turn refugees into scapegoats, it is important that EU member States show, through collective action, “that Europe is capable of engaging effectively and in a principled manner with refugee movements, helping to stabilize refugee flows over the long term through more strategic external engagement – while at the same time, continuing to welcome refugees in Europe,” he added. The agency has also proposed a Better Protecting Refugees in the EU and Globally paper, outlining measures to address the reasons why refugees are fleeing, and simplifying an asylum system that would make the process of identifying and registering more efficient. The system also builds on elements of the existing Common European Asylum System (CEAS) and some reforms proposed by the European Commission. The reform would also guarantee the right to asylum, enhance security screening, and improve management of population movements. “History has demonstrated that Europe is stronger when it addresses its challenges together; and I firmly believe that this is still possible today,” stated Mr. Grandi, adding that it is time for a new vision for Europe’s engagement with the global refugee crisis. According to UNHCR, the system will also include a common European registration system, a common approach to unaccompanied and separated children, and efficient system for returning individuals who are not in need of protection to their countries of origin. As the security situation has stabilized in villages near war-torn Mosul, where Iraqi military operations are under way to wrest the city from terrorists, the United Nations refugee agency and its partners are racing against time to distributing winter kits to those who remained or returned home and those newly-displaced as plunging temperatures hit the area.